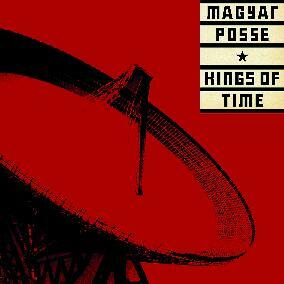 Magyar Posse - "Kings of Time"
The band comes from the fertile musical grounds of Pori, Finland. This is the bands second CD release. The band plays a mellow, floating music most of the time but always creating special moods. This is music made to be heard with films. This CD contains 7 tracks with a lot of varied instrumentation and moods expressed. The tracks seem to blend and melt together. While the opening track is purely a floating spaced out number, the second number, has drums, violin and voices and reminds me a bit of the operatic feel of Magma but in a very different way. The third track is an 11 minute song and starts very mellow but then builds up on a piano line. Again a violin, saxophone and voices take the song to a higher level. A very dramatic number. The fourth track is a slow moving piece with piano and waves of sound moving over the fore and background. Track 5 has some dark and beautiful acoustic guitar that just floats and glides as the band build upon this. This track make very interesting use of the voice. The CD closes with a song that is the heaviest number of the CD and one of the few based on a strong guitar riff. Cool spacey sounds are mixed in as well as strange voices in the background. You really feel like you are in some kind of David Lynch film or something. Interesting and very original material. For more information you can visit the Verdu web site at: http://www.verdurarecords.com.